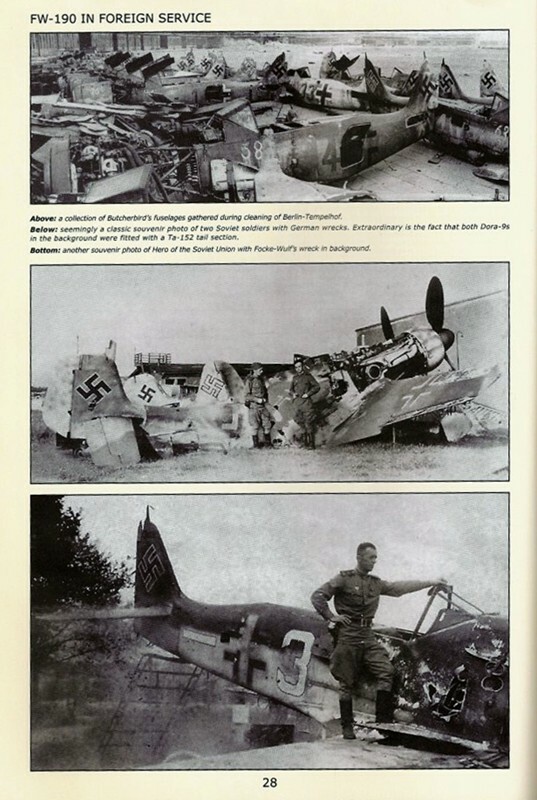 Just when you thought that everything had already been published on the subject of the Focke Wulf FW-190, along comes another book that destroys that theory. This is Volume 2 of a set of books on the FW-190's that were captured by various Allied countries during and after World War II, and concentrates on the colors and markings rather than their ultimate histories, although some individual aircraft histories are provided. Volume 1 included aircraft captured by the British and Americans, as they obtained most of the FW-190's in the West. Volume 2 covers those FW-190's collected and/or used by the Soviet Union, South Africa, Yugoslavia, Japan, Romania, Hungary, Spain, Turkey, France, Sweden, Poland, and Czechoslovakia. Photos illustrate the aircraft not only in their Luftwaffe markings, but often in the markings of the air forces testing or operating them. Photos are almost always accompanied by excellent color profiles, and not less than 15 aircraft are illustrated by three or four view color drawings. This book contains a wealth of information on this little known subject, making it possible to accurately portray many different versions of the FW-190 in some unique markings, Luftwaffe and foreign. The book is printed on very high quality paper, and the photo resolution is outstanding. Most of the photos have not been published before, and some of the subjects are ones that I was unaware of. The few that are conjecture are identified as such, so the modeler can be aware of the historical accuracy of a particular color scheme. 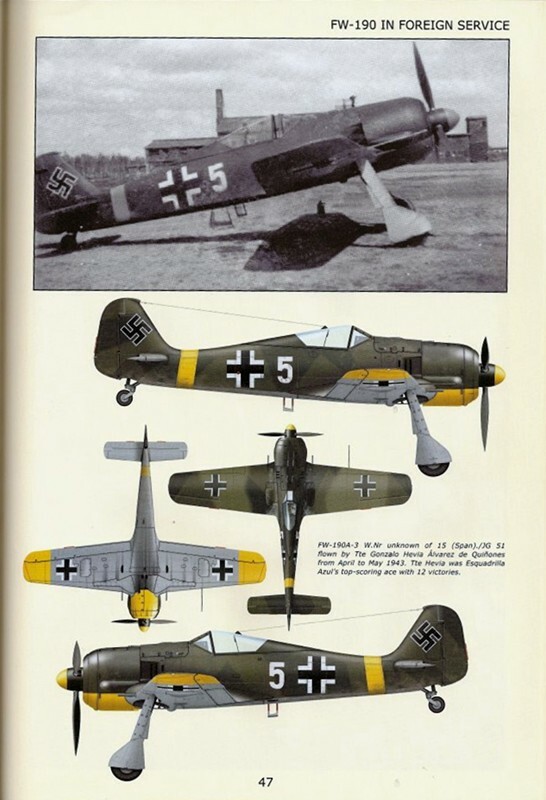 For the Luftwaffe enthusiast, there are plenty of new color schemes provided, and for the modeler in general, the captured examples provide many extremely colorful liveries for new models. In addition to the general coverage, there is a 10 page section at the end with photos and information on aircraft captured by the British and Americans that for some reason could not be included in Volume 1, and these include some very colorful examples. 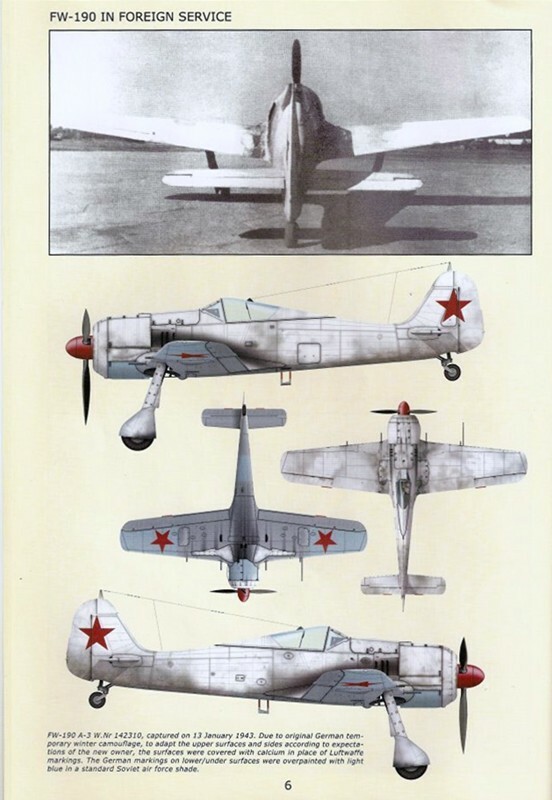 And the inside front cover lists many of the individual aircraft captured by Soviet forces. So if you are looking for photos and color schemes of FW-190's in French, Russian, Turkish, Hungarian, or other exotic markings, this is the book for you. I could only find two things to comment on, but none of these really detracts from the usefulness of the book. 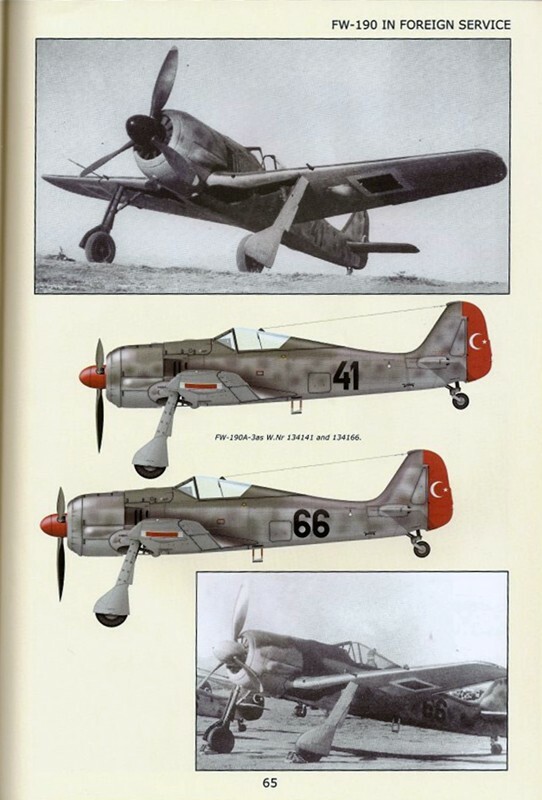 Some of the color drawings seem to be repetitious, providing numerous examples of Turkish and French aircraft, which were mostly all painted the same except for the numbers on the fuselage sides. However, there were probably detail differences, so this would be useful to modelers. Secondly, the book was obviously translated by writers whose English skills, while good, need some polishing. Any American or British proofreader could have corrected these very easily, although nothing is lost in the communication of the essential information. It just seems a little awkward to read at times, but I have found this to be true with many publications in English that originate in non-English Speaking countries. This book helps to complete the story of the FW-190, and would be useful to any serious modeler of the FW-190 series. It contains information that is unavailable anywhere else, and the publishers are providing a great service to the aviation history and modeling communities. Highly recommended. Thanks to Kecay Publishing Company and IPMS/USA for the review sample.